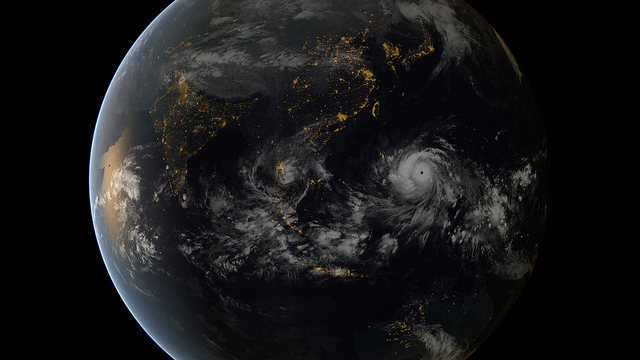 Typhoon Haiyan from space. Photo: NASA. The Filipino diaspora is one of the most widespread in the world, with members making their homes from Alaska to the UAE. The FT reports that in 2012, overseas Filipino sent $21 billion back to their country of origin. Now, in the wake of Typhoon Yolanda, one of the most powerful storms in recorded history, Filipinos around the world are holding fundraisers and drives to help send aide to those struck by the devastation. The Arctic is no exception, as Iqaluit, Nuuk, and Reykjavik are just three cities where Filipinos are joining forces. Iqaluit, home to ~70 Filipinos. Photo: AScappatura/Flickr. In Canada, from 2003-2012, Filipinos constituted the second largest group of immigrants after China, topping even the United States . In 2008, the Philippines actually overtook China as the leading source of immigrants into Canada. An upgrade in October to the existing memorandum of understanding between the Philippines and Saskatchewan on facilitating the recruitment of Filipinos for jobs in the province will likely increase immigration even more. Breaking it down by province and territory, from 1998 to 2011, the Philippines were the highest source of immigrants into the Northwest Territories, where 395 Filipinos moved, and Nunavut. 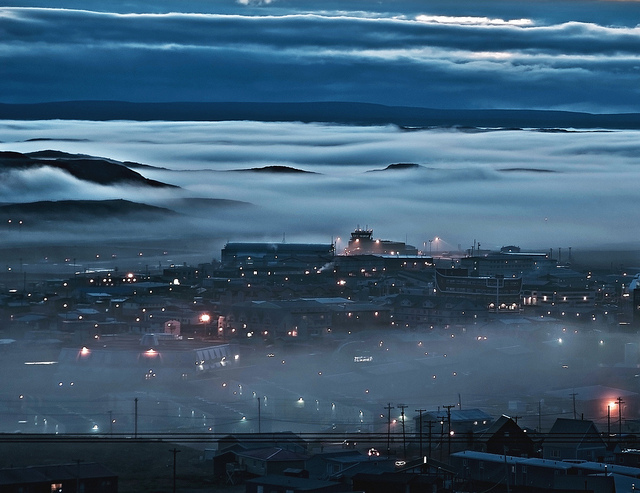 Nunatsiaq Online reports that in Iqaluit, the capital of Nunavut, there are approximately 25 Filipino families, numbering about 70 Filipinos total. Filipino-Canadian-Nunavummiut efforts to rally around their country of birth are working. Last week, the Our Lady of the Assumption Roman Catholic parish raised $750 to donate to the International Red Cross for relief efforts. Chief Magistrate of the City of Iqaluit, John Graham, is helping to organize a fundraising dinner on November 30. A corporate donor will sponsor the dinner, for which a local grocery store will donate a roast, shrimps, and halibut. A regional airline is donating two return tickets from Iqaluit to Ottawa, while a Nunavut bank will open a temporary account, the Filipino Typhoon Relief Fund, to accept donations. Filipinos and non-Filipinos alike – all Nunavummiut – are thus banding together to send relief to the Philippines, thousands of miles away from Iqaluit. 825 kilometers from Iqaluit across the Davis Strait in Greenland, a sizable number of Filipinos reside in the capital of Nuuk. Along with Thais, they make up the largest group of Asian immigrants in the country. Nuuk hosts both a Thai restaurant and a Filipino market. There are only 60 registered Roman Catholics in all of Greenland (pop. 57,000), of which many are Filipinos (the others being Poles and Danes, for the most part). Greenland’s Red Cross has raised 100,000 kroner for the Philippines earmarked for clean drinking water. According to the Arctic Journal, half of that sum comes from the Red Cross second-hand store in Nuuk, often frequented by Filipinos residing in the city. 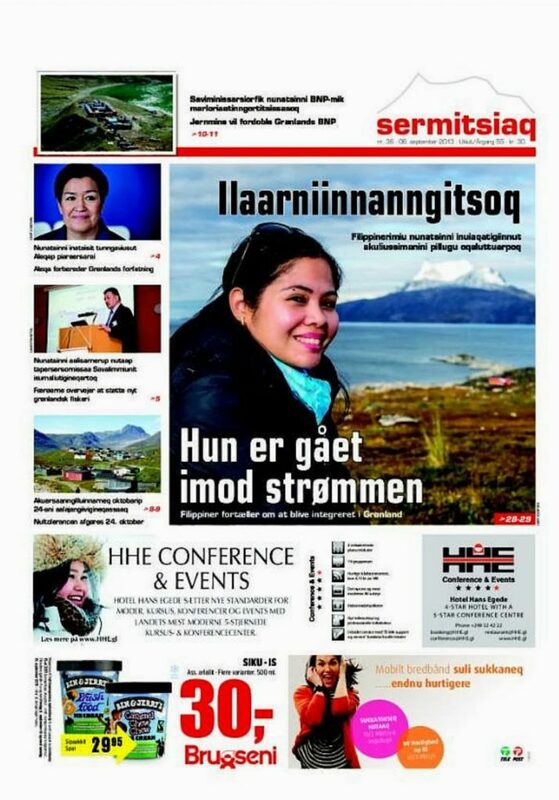 An op-ed in Sermitsiaq asks why Greenland’s government isn’t doing more to help the Philippines recover; so far, it has only sent a letter of condolences to the Philippine Embassy in Denmark. In living in Greenland, Filipinos probably have a relatively harder time of maintaining their traditions. It’s not so easy to fly in a lechon for a party, as Nuuk is arguably even more remote than Iqaluit. But Filipinos have still been able to adapt and build communities both amongst themselves and with other residents in Greenland that they now are able to call upon in a time of crisis back home. Reykjavik is a more cosmopolitan city than Iqaluit or Nuuk. As a result, it has somewhere between 1,500 and 2,000 Filipinos, many of whom work as office and factory workers and nurses. The Filipino-Icelandic Association is helping to collect donations, with more instructions on how to help here. An article in the magazine Iceland Review by Marvi Ablaza Gil, a Tagalog teacher living in Reykjavik, questioned why the country wasn’t doing more to help out the fellow island nation, especially in light of the surprising amount of cooperation between the two countries. Iceland, a global leader in geothermal energy, has helped the Philippines expand its geothermal capacity, which currently sits at 15 percent, while hydropower is at 14 percent . It was not until November 12 that Iceland came forward with a donation of $100,000 – the same as the amount that China initially offered (though it has now increased that figure to $1.6 million). Gil offered in her article “The connection between Iceland and the Philippines may not be as obvious and tangible as Iceland and Denmark but see, we do have a connection and a future together.” The same could be said about the Arctic and the tropical island states, as climate change disproportionately affects both. The relationship between Typhoon Yolanda and climate change is uncertain. The latest IPCC report concludes that a large percentage of climate change is irreversible without significant, sustained reductions in carbon dioxide emissions. Since that’s not going to happen anytime soon, humans instead must adapt. One way of adapting is harnessing the power of international networks and diasporas. Filipinos may be more adept at this than most. While every culture has its own heterogeneities, one tenet of Filipino culture is kapwa, Tagalog for “togetherness,” “shared being,” and integration with the surrounding community. The house that Gabuna built in Nuuk exemplifies kapwa. In finding global solutions for climate change, perhaps the international community could adopt some of this mentality.